This piece of news article reminds me of a miracle God has done in Sarah's womb. If you are not sure what happened, feel free to go and read Genesis and find out what happened. 4) Spend 300 points for a module which cost 1 point for others. I went to watch Charlotte's Web yesterday together with the CG. To make the long story short, it's about the struggle of this pig who had made friends in a barn to avoid his slaughter in the smokehouse for Christmas. In the process, he received help from this spider called Charlotte, who promised that she will not allow Wilbur the pig to end up in the dining table. How she exactly did it, I will leave it to you to find out. But it was touching in the end. The ending really reminds me of a friend who will never break his promise, whatever promises that he made. It was very touching. Perhaps the dramatic impact can only be felt when you watch it. Witness the friendship between an unlikely pig and unlikely spider - a friendship which eventually changed the way the people around them live. It's movie that really touched my heart a lot and I'm sure it will touch your heart too. Quite a surprise. HY2217 was the module which I know has the least chance of getting an A, cos of my project, but it will still remain my fav mod of the sem. TR2202 was a surprise, cos I expected a B+ the most, given my relative quietness in the forum... or maybe if I have been more active, it would have been an A+. The rest was sort of a bonus. I didn't expect an A- for HY2246 too, though HY2243 was quite expected and hoped for. MNO1001 was a difficult one to gauge, cos I didn't really know how I do as compared to the rest. The final paper was a bit of a disaster to me, cos I had a stomachache and I can't concentrate on the paper properly. Well, some of the posts for the past few days had been politically incorrect, or maybe even sounded extreme. And probably, some of you have read it and might get offended by it. Firstly, I have to confess that it is normally not myself to post such politically incorrect comments. Secondly, I would like to say sorry if you are offended. Perhaps even these posts may turn you off from God. It may seem that I am not a good testimony to God. How can I say that I'm a good testimony to God? Perhaps after a year, I realise that I am still unable to share my joy effectively with the people I want to share that joy with, how can it be a good testimony? For one year plus, my growth can only be observed by myself, God and the brothers and sisters closest to me and not other people, how can that be a good testimony? For one year, people are still avoiding me, and I am still unable to communicate effectively, how can this be a good testimony? Maybe I should repent about it. Today is Christmas Day. It's a day of giving and receiving. But it's the day people find joy more in giving. And of course, Christmas Day is such an appropriate day for giving gift, because it commemorates the coming of a gift larger than life. To start the real Christmas story, I'll go back in time, to about... the beginning. It has been a good Christmas Eve. We went caroling in the evening around the town area. We went to One Raffles Link, followed by Marina Square, followed by Raffles City, followed by Esplanade. We ended off with Esplanade with a bang, and everyone was so high lah. I was very disappointed just now in the afternoon when I left my house. Apparently, Yanwei and Eric did not manage to make time to come for the Christmas special, which turned out to be very good, exceeding all my expectation, but then... what do you expect, it's God, you know. I was looking out to my kitchen window just now when I was having a hot cup of milk. And I was surprised that there was a pasar malam out there in the opposite block. I have not seen the set up for the past few days. It's either I have not looked out that window for a long time, or it just happens. It has been raining cats and dogs for the past few days and I didn't expect that there was to be a pasar malam. By the way, the rain has made the climate so cold that I didn't even need to switch on my air con in the night. If you're not choosing to spend regular time with God, then you're choosing to die spiritually. In many cultures, life is centered around food. Very few people in the western world would go for more than 10 or 12 hours without food or drink. Besides the fact that food is built into culture, doing so would make one very hungry. Many people wouldn't dare going physically hungry; yet they starve themselves spiritually. If you ate food only once a week, you'd certainly die of starvation and malnutrition. Yet countless Christians do exactly that in their spiritual lives. It is no wonder that Jesus called himself the bread of life (John 6:35). In order to grow spiritually, you must feed on spiritual food -- God's word. Have the attitude found in Isaiah 26:8: Yes, Lord, walking in the way of your laws, we wait for you; your name and renown are the desire of our hearts. Make it your desire to know God better. Yesterday's message was about walking with the three wise men as recorded in the Bible. It was a good Saturday yesterday. The afternoon gave a me a big scare. Apparently, something cocked up in the NUS server and results were released prematurely. Everyone began checking their result and Kian Choon actually called me to complain that he got a B+ for his film and history. I was praying then and before he called me in the midst of prayer, I felt a sense of uneasiness. So it was he who has to unsettle me... Well, morning I had already got a scare when Robert called me to ask me for my result.... And I decided to make a trip to Mac to log online to check out my result also. I was praying to God, not to let me go through this at this stage.... and I think He answered my prayer. The NUS website took forever to load and I decided to give up and live and let live. I used to be a skeptic in this thing that I am so passionate now: Christianity. I was skeptical. I asked myself questions why must I just believe in one God and why can't I just stick to my own beliefs. I asked, why should I believe in Jesus? I asked, if Jesus is so good, then why this why that. In short, I was really closed off. I think a skeptic-turned-convert is pretty powerful. It takes a lot to convince a skeptic, but once convinced, a skeptic can become God's powerful tool. Take Paul for example. When he was Saul, he persecuted Christians, and perhaps was the greatest skeptic of his time. But he saw Christ, and became one of the most powerful tools to be ever used by God. The bulk of the NT was written by him and today, a lot of churches have their origins in him. There is something that I felt that I have not elaborated well in my previous post and I hope to elaborate more about point 3,as it has been an important point that I have gained from the session yesterday and to mention it in just one sentence would not do any justice to it. Basically, 100% input from man and 100% input from God. What does it mean? Let's put it in a simple perspective. We need to be saved and reborn of the Spirit. God has already put in His 100% by sending down His One and Only Son (watch Nativity Story). But we on ourselves need to do our part also. We need to believe and confess with our mouth that Jesus is Lord, before the whole 'contract' can be worked out (John 1:12, Romans 10:9). I watched Nativity Story with Edwin, Ceyang, Jessie, Shuyi and Yanwei yesterday. It was a good movie about the birth of Christ, right from the beginning with his conception in Mary's womb. The movie basically combined the beginning of Matthew and Luke and tried to fill in the gaps in between with 'made-up scenes' but these scenes are generally considered biblically possible. The movie revealed the on-route journey of Joseph and Mary towards the manger, and in between scenes actually showed comical scenes of the three wise men setting out to search for the Messiah. I shall not elaborate the movie too much, but if you want to read about the original story, go to this site: watkins.gospelcom.net/cmasstory.htm. After screwing up my Linux twice, resulting in the need to reinstall the OS twice yesterday, I finally managed to install Beryl and XGL into my Linux. Now my Linux desktop looks cool and may even be better than a OSX desktop (ok, that's daydreaming) but certainly as cool as Window Vista now. Ubuntu thus becomes my answer to Vista. 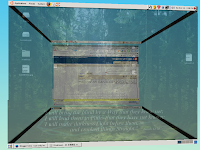 I'm blogging in my laptop, using Linux OS, the Ubuntu version. It took me a few days to get a hang on how it works. But this is so cool. I only have a few complaints - that is Gaim is a bit too primitive that I have to download aMSN, and even so, it can't support all my chinese wordings. But I'll figure that out. Also quite scared me, cos initially I can't connect to the net, and I can't play my mp3s... now I finally get them settled. Still exploring the platform. sometimes i just wondered why people want to put religion in between of relationships. like someone go ahead lah! talk about religion for what f*** sia~ say what, "God has prepared one for me", "it's a sin", blah blah blah. Let me tell you the real sin: to like someone but not going for her because of your religion or whatever reasons. to love someone but your religion says it's a sin coz she is a non-believer. that's the real sin. and you know what, you already said God has prepared one. how you know the one is a believer? you mean God only favours the believers lah? Pui~ All are equal, at least that's what i believe, when God created mankind. and you know what? because of that, your destiny can be anyone, anywhere. It has been a tiring three weeks in school, camping over and being the guard duty personnel for the classroom and as well as the PR personnel for the security guards. Certainly I won't miss sleeping in the sleeping bags although I know I will be doing so in every exam period as long as we enjoy good relations with the security guards at E1A. Our classroom is certainly the most famous study room in E1A this period. People walked outside the classroom and were amazed by our food... Think they may be envious of what we have... They also saw the sign the Lord is with us, and were amazed. I was also quite amazed to know of the Cellulites who studied at the other classroom near ours. They are a group of Christians also. You know what happen when you run a 21km half marathon with an unprepared body and a blister 3km into the run? You get an ached up body and a pair of limping legs. Yeah, that's what happened to me. It was only by God's grace that I was able to complete the race in under 4. I was listening to the song Silent Night, the song, somehow just provides a tranquilizing feeling in my heart. I feel that I just want to sit down and just relax, and not think about anything, look at the stars, and marvel at God's wonder. It's gonna be my last paper on monday, 4/12/2006. It seems as if yesterday that I was sitting with Claramae and Robert at the BP Mac arguing about Christ. I remembered last year the exam ended a bit earlier. But this year, it was to end late... but who cares, I just want to enjoy my Christmas.